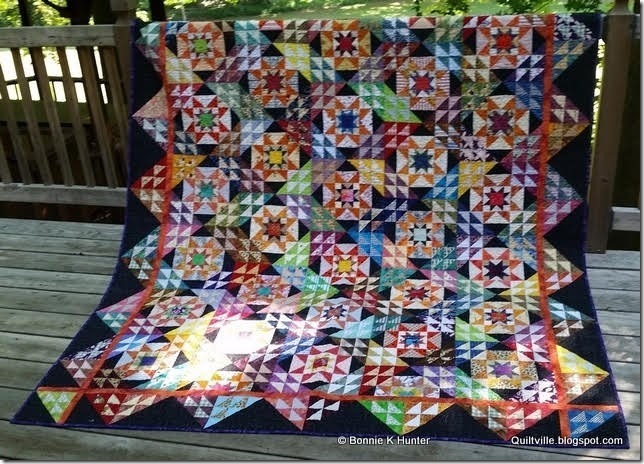 Quiltville's Trunk Shows & Workshops! Addicted to Scraps! 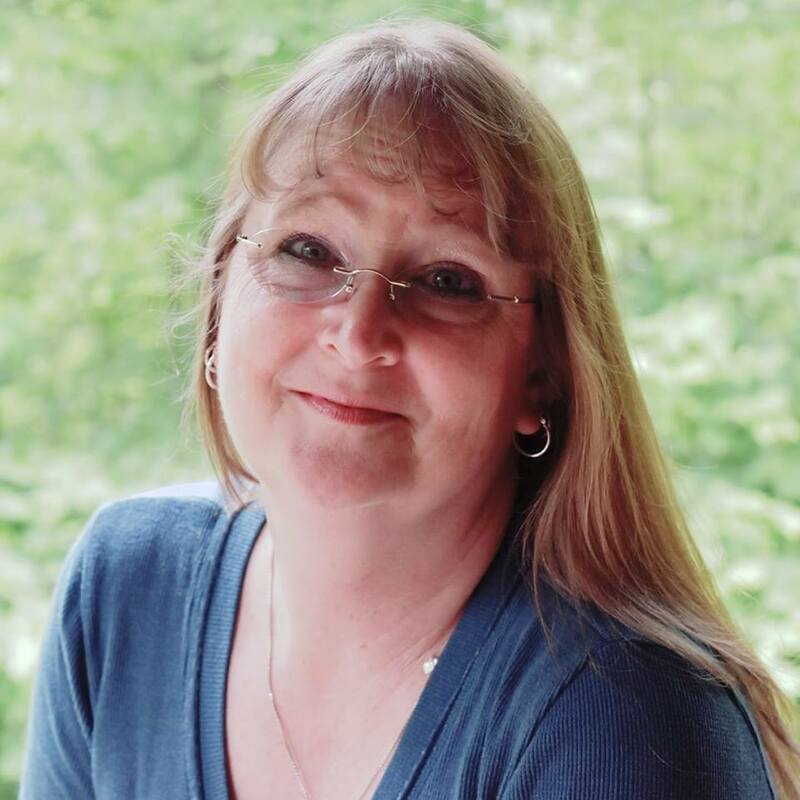 This lecture takes you through my years of scrap quilting and how I have organized my scraps and leftovers to be easily accessible and workable into my quilt making. Also includes discussion of tools of the trade that I find helpful in my scrap using. I am a scrap USER, not just a scrap saver! 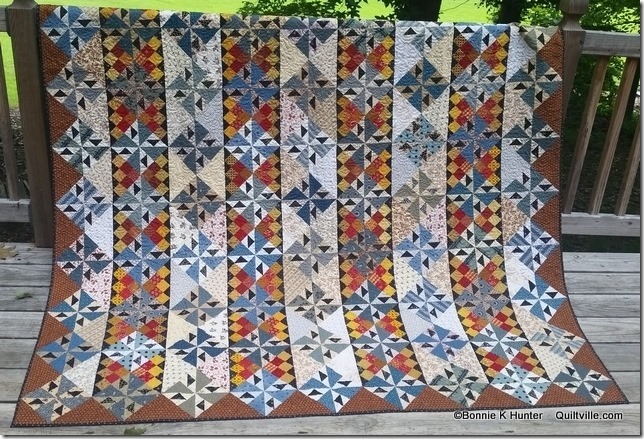 There is a difference....this lecture will inspire quilters to organize their scraps and start turning them into beautiful quilts. 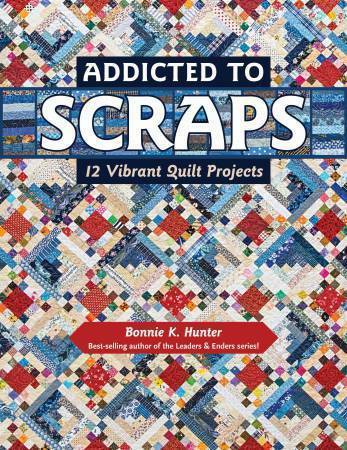 Features quilts from my new book Addicted to Scraps. Adventures With Leaders & Enders! This lecture focuses on quilts made between the lines of sewing other projects! A while back I found myself nearly paralyzed by my burgeoning stash and scraps after nearly 30 years of living by the credo: "She who dies with the most fabric wins!" It was then I turned to my love of antique scrap quilts for inspiration in putting the rewarding method of sewing Leaders & Enders to work. The Lecture features quilts from my book by the same name, along with others from my personal collection--starting from very basic simple designs, to more complex ones, inspiring you on your way to thinking outside the box when it comes to your methods of piecing and using what you have on hand to create beautiful, one-of-a-kind scrap quilts in between the lines of chain piecing other projects. This is multitasking at its best! String Frenzy! These are not just your Grandmother's String Quilts! 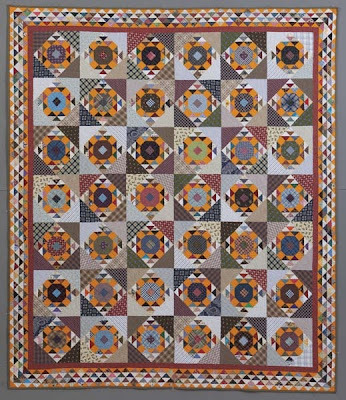 String Quilting has a colorful history and can create exciting elements when mixed with traditional patchwork shapes! 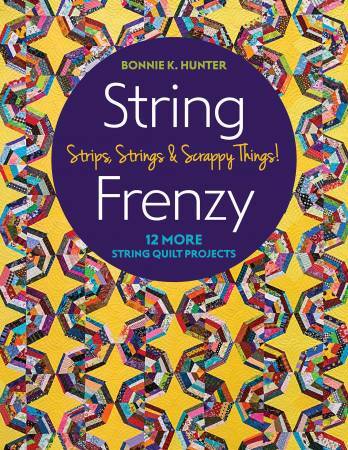 String quilts from small to large will fill the listeners with ideas and inspiration to dig into their own stashes and sew up a storm of strings! 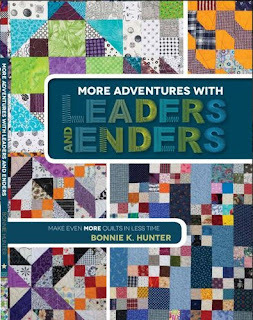 Quilts from Scraps & Shirttails, Scraps & Shirttails II, Adventures with Leaders & Enders, and my latest book, String Fling will be featured. 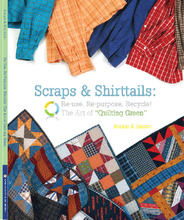 Trunk shows last approximately one hour + Q&A and will be illustrated with loads of my quilts. I will need two volunteers to hold quilts, two volunteers to fold the quilts and 2 tables to lay quilts on. If I am flying to your area, a quilt stand (and sometimes a power point projector) may be needed as I can't bring my own! An Extra table to sit and sign books at is also helpful. If your group is piggy-backing with another group, lecture topics may be combined as I can only travel with one trunk show. Please choose workshops from the extensive listing below. Workshops from book patterns do require purchase of the book by each student either prior to, or at the start of class. 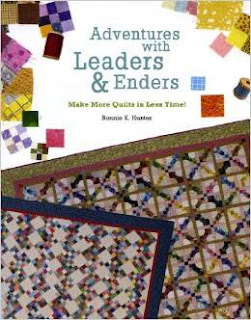 Books and patterns are available in the Quiltville Store and in class at a DISCOUNT. Due to copyright law, no photocopies or sharing of patterns during class is permitted. New classes will be added as new books are released, so check back with me! *NOTE* In addition to the class supply lists below, your students may be required to print out their own class instructions as found on my website. This helps keep printing costs down for everyone! Please check with me when choosing your classes. Quilt a scraptastic rainbow of colorful stars! 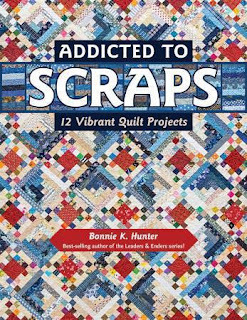 Put those precious scraps to work for you with a dazzling quilt pattern from best-selling author Bonnie K. Hunter. Sew a field of wonky stars atop colorful scrappy squares and low-volume, string-pieced sashing. Easy rotary cutting and simple patchwork make this pattern ideal for beginners, with pressing tips for perfect results! Let your imagination run wild with fabric and color placement as you play with light and dark values. And remember, if the fabric is still ugly, you just didn’t cut it small enough! • Popular quilter and author Bonnie Hunter teaches you to sort fabrics by value. Pattern packet required. Available as a 1/2 day (4 hours) or Full Day (6 hours) workshop. Patterns available IN CLASS at a discount. Wonky Wishes Class Supply List. What's to love even more about a two-color quilt? VARIETY!! Students will have loads of fun piecing string blocks by color family, and the half-square triangles in the quilt come easily from strip sets using my Essential Triangle Tool. String Frenzy book required. Emerald City Class Supply List. A modern uptake on the traditional Spider Web string quilt, students will have fun learning the basics of String Piecing on paper foundations creating one of a kind quilts, and sharing scraps along the way! String Frenzy book required. Serpentine Web Class Supply List. String units combine in a setting invoking visions of circles, with no curved seaming necessary! This is an intense workshop using the Essential Triangle Tool and Tri Recs tools for the blocks. Students may swap strips for greater variety! String Frenzy book required. 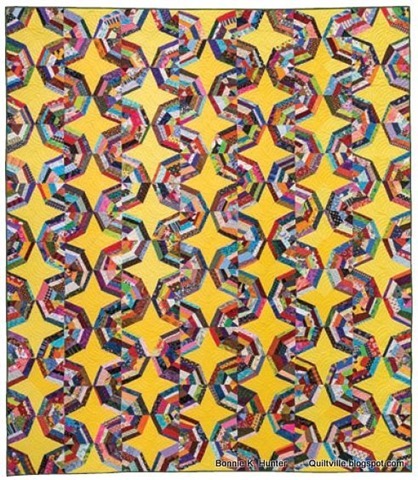 Small friendship stars spin and swirl through waves of blue triangles and abundance of neutral strings! Students will learn the ins and outs of making half-square triangles from strip sets using the Essential Triangle Tool. Fun is multiplied when students swap and share fabrics to increase their variety. These blocks are large, filled with small piecing, but it is straightforward and a joy to make. String Frenzy book required. 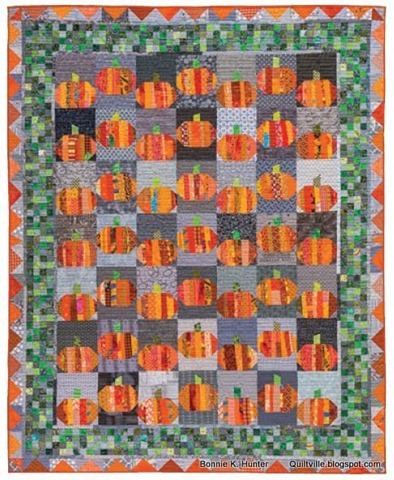 Who doesn't love a cute Pumpkin Quilt? Students will love the fun of creating string pumpkins with imrpov pieced stems - no two are alike! 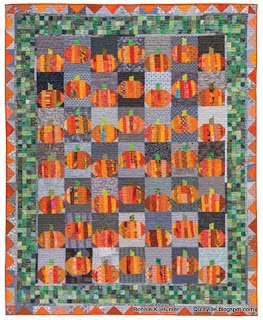 Students can swap orange and gold strips for more fun and variety in their blocks - it's a Punkin' Patch of string piecing fun! String Frenzy Book required. Punkin' Patch Class Supply List. 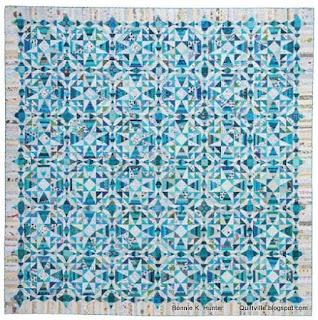 Simple nine-patches from easy strip piecing in blue and neutral combine with neutral string snowball blocks with corners of cheddar – this quilt is perfect for all skill levels and sure to steal your heart to become your favorite yet! 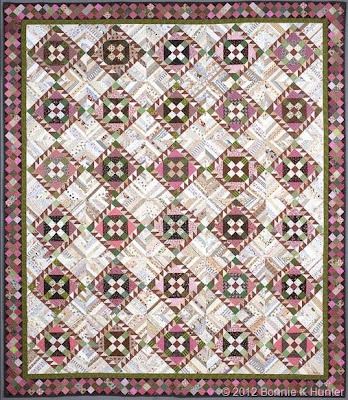 Students will learn the basics of string piecing combined with traditional patchwork elements in creating a quilt they will love. We’ll be using my Essential Triangle Tool to cut the background triangles for the square in a square border units in the quilt. Wonky string geese are honking as they fly north and south in strippy fashion. 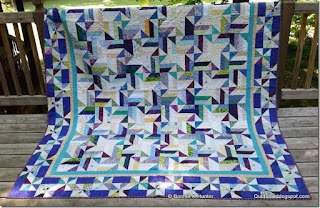 Students will learn the fun and versatility of string piecing, and hone their skills with using the Essential Triangle Tool for wing triangles. 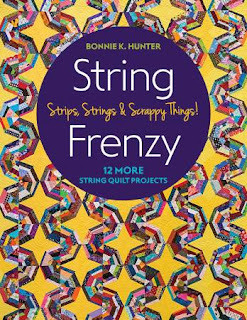 String Frenzy Book required. Xing is the Chinese word for STAR. Students will learn both the fun of crumb piecing star centers, using my Essential Triangle Tool to cut the surrounding star point and background triangles from strips, and add some fun string-pieced alternate blocks into the mix for maximum scrappy fun. String Frenzy Book required. Sand Castles recalls those long summer days and cool summer nights, complete with marshmallow roasting and s’mores aplenty. This class combines my love of simple four-patch units with fun string piecing and oodles of color play. Students can even swap strips and strings with each other for more variety. We’ll be using my Essential Triangle Tool to cut the background triangles for each pieced block section from strips. Daybreak is my absolute favorite time of day. The crisp clear aqua of the background fabric against the beautiful neutral string sashings and borders bring a calm to the other-wise riotous scraps within the 4 patch units. 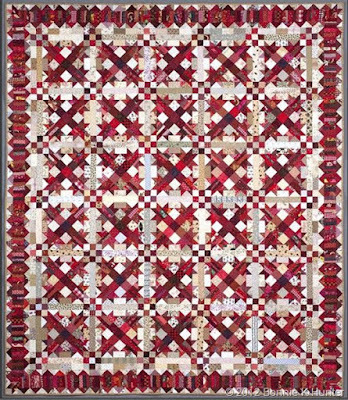 Students will learn the basics of string piecing combined with traditional patchwork elements in creating a quilt they will love. Students can share scraps in class to expand their variety. String Frenzy book required. Quilts with small simple squares that chain through the quilt are high on my list of favorites! This two-block quilt is made from a plethora of scraps and strips and part of the fun is sharing fabrics with students in class. Quilt blocks with motion provide endless possibility for quilt designs from simple shapes and units. Throw in a secondary block, turn the whole thing on point, and you create vertical columns where pinwheels can happily spin away. Fulfill your own Wanderlust in this striking design created in easy strip widths using specialty rulers for half-square, quarter-square and flying geese units from your scrap stash. Learn to create from the whole crayon box stitching stars in whirlwinds of color, with oranges purples, reds, greens and blues and beyond. For even more fun and variety, students can swap strips in class. Students will come with pre-cut strips ready to slice, dice and sew in class, a great practice in learning to play with value and determine "What is a neutral?" This workshop is even more fun when students swap and share strips in class for more variety. Available as either a 4 hour or 6 hour workshop, and guaranteed to be a scrap-load of fun! Start with a variety of strip sets, add some slicing and dicing and some easy stitch & flip corners and we've got a scrap quilt with loads of movement complete with bonus triangle units to be used in the optional border! Quickly cut pairs of half square triangles into already matched pairs ready for stitching using Bonnie's Essential Triangle Tool. Students will gain confidence when working with this tool while sewing up their favorite scraps into wonderfully versatile Box Kite blocks! Jelly Roll Friendly workshop. Available as 4 or 6 hour workshop. Sew a basket full of Moth in the Window blocks from strips and squares. Easy rotary cutting and simple patchwork make this pattern ideal for beginners, with pressing tips for perfect results! Students will gain confidence in accurate strip cutting, and working with the Essential Triangle Tool for perfect half-square triangle units from strips. 4 or 6 hour workshop. 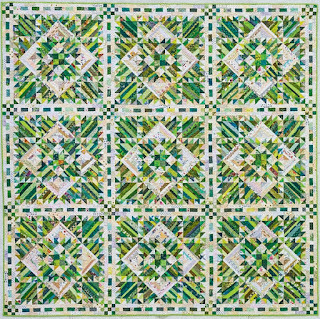 Garden Party is a two-block quilt and is available as a 4 or 6-hour workshop. And BEST of all? NO TRIANGLES are cut or sewn into this quilt! 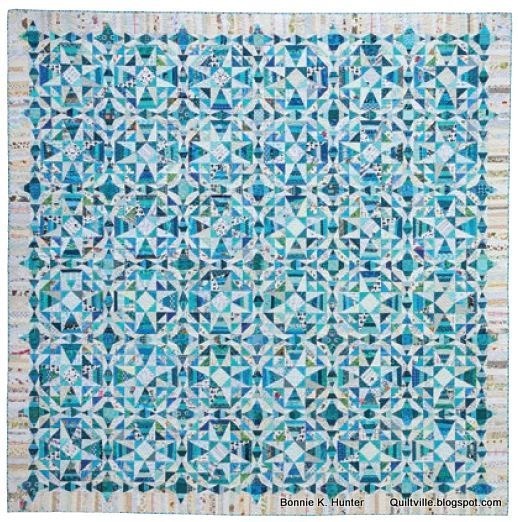 This entire quilt is made from 1 1/2'' strips and squares, and is great fun as a group --especially if a whole lot of swapping is going on for maximum scrapability! Quilts with so much motion and sew many fabrics speak to my scrap loving soul! This two-block quilt is made from a plethora of scraps and strips in just 2 strip widths: 2'' and 3 1/2'' and uses my Essential Triangle Tool. Part of the fun is sharing fabrics with students in class. 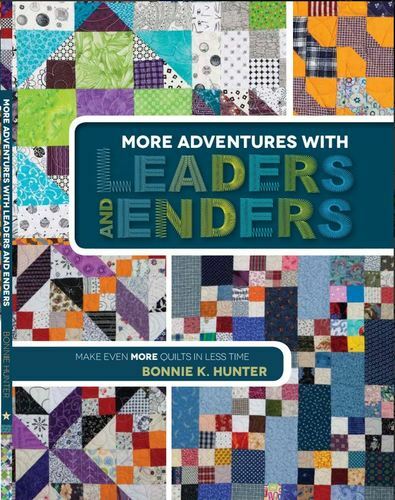 More Adventures with Leaders & Enders Book! Four patches and rectangles in a barn raising setting, perfect for maximum scrap usage! 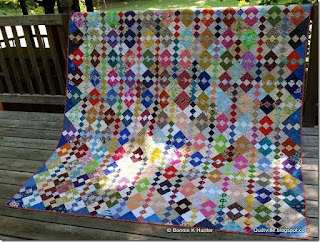 And better yet – this quilt has NO triangles! Come ready to play in the scraps in this fun workshop, learning the ins and outs of accuracy in cutting, stitching, and more. This workshop is perfect for everyone from beginner to advanced quilters alike. No, we won’t get the whole quilt done in one day, but we will have fun swapping strips with each other and making some good progress. 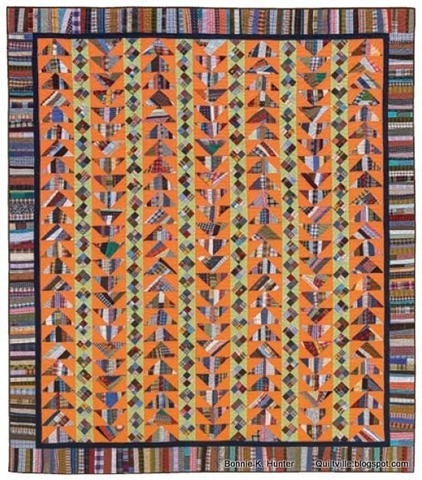 And this quilt makes a GREAT Leader & Ender project for you to work on in between other things! 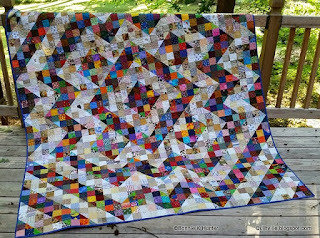 Spinning stars and ladder blocks abound in a motion-filled scraip quilt made completely from 2.5" Squares and 2.5" X 4.5" rectangles! Students will come to class with fabric shapes pre-cut ahead of time, ready to sew, share and swap if desired. 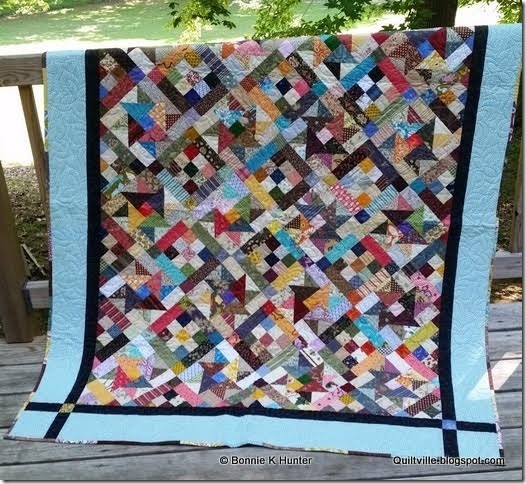 This is a stress-free fun class with lots of POW in the finished quilt! 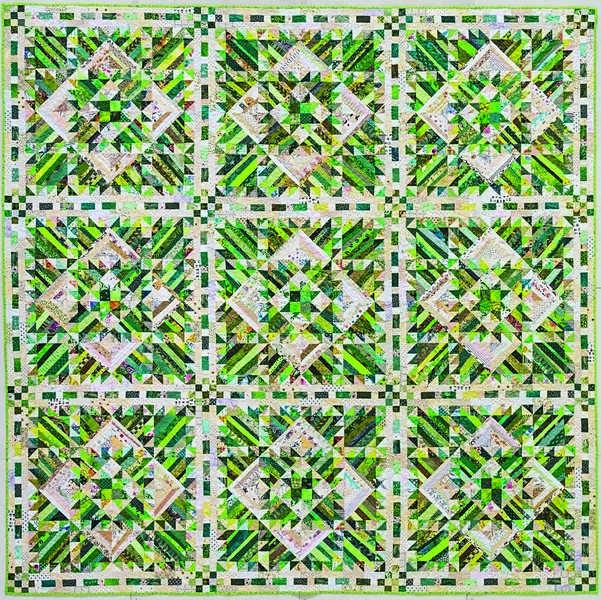 I love blocks that combine to create a secondary design, and the corner checkerboards of each block in this quilt meet giving the appearance of a two block quilt set on point, when it is just one block set side by side. Don’t faint – but get excited! There are 104 pieces in each 12” block. Students will master the use of the Easy Angle ruler for quick half- square triangle units! Students will come to class with fabric strips pre-cut ahead of time, ready to sew, share and swap if desired. Exploding stars radiate from small triangles from treasured scraps! A Great 3 color quilt, if students don't like blue and green, they can choose any 2 colors plus background! Students will master the use of the Easy Angle ruler for quick half- square triangle units! Students will come to class with fabric strips pre-cut ahead of time, ready to sew, share and swap if desired. Simple Patchwork units combine to create undulating curves of motion in this fabulous scrap quilt, great for all color combos! Students will master the use of the Easy Angle ruler for quick half- square triangle units! Students will come to class with fabric strips pre-cut ahead of time, ready to sew, share and swap if desired. A sunset picture of Orca Bay, Cordova Alaska was the inspiration of for this quilt. I'll always carry Cordova and Orca Bay in my heart! Students will learn basic string piecing skills and combine them with triangle units cut from strip sets using my Essential Triangle Tool in this class. Half-square triangles, quarter square triangles, and multi-part triangle units are covered! Two color families! Choose red and neutral or whatever your heart desires, and bring a variety in strings and strips ready to sew up a scrappy storm! This quilt is no turkey! Our fun expands when students swap and share scraps in class to increase variety! Small strings and crumbs are precious pieces and so much can be done with them! Even small units can be a place to show off your little bits. The base units for these tulip blocks are string pieced, and added to the patchwork parts to complete each "flower". Solid red makes the tulips pop with color! Students will learn the basics of string piecing, have a lot of fun trading and sharing stories about their scraps and have a stringy-good time! Stars and chains in blues and neutrals are sure to capture any star-lover's fancy! 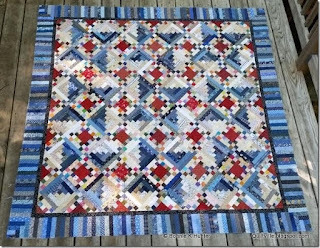 What a great way to clear out scraps by choosing two color families: A foreground (Blue) and a background (Neutral) Students will learn the basics of string piecing along with learning to use the Easy Angle ruler to create half square triangle units from 2 1/2" scrap strips. 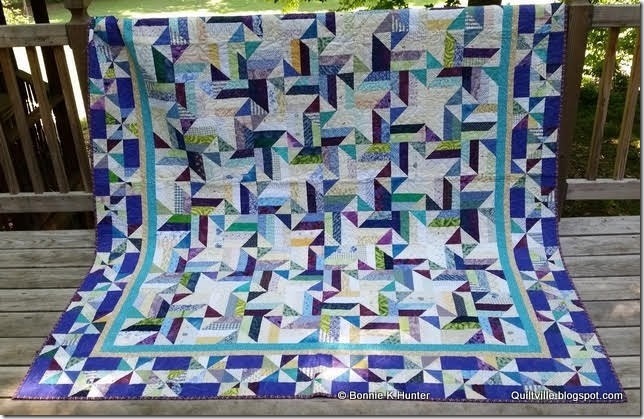 This quilt was a great way for me to use a large variety of blue and neutral scraps for the half-square triangles, and even more scrap fun clearing out a whole bx of neutral strings used in the alternate block areas. Warm Browns and reds bring to mind the delicious smells of spice cookies baking in my oven! Students can choose any 2 colors they like together plus a background for their quilts. We will spend part of the day piecing string blocks and follow up quarter-square triangles using the Companion Angle ruler. 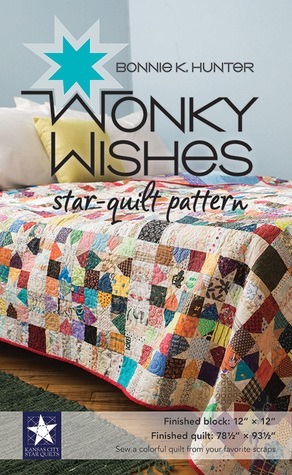 The fun in this quilt is the variety of fabrics in it! 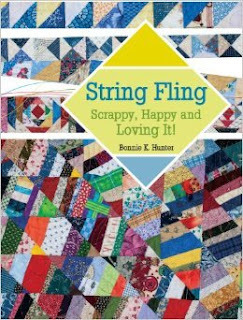 Students will learn the basics of string piecing, have a lot of fun trading and sharing stories about their scraps and have a stringy-good time! 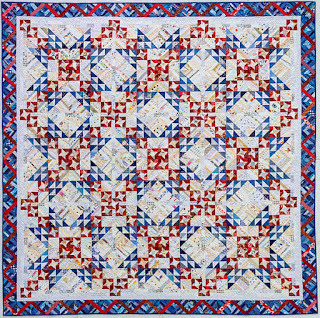 Roll Roll Cotton Boll is a dynamic scrappy quilt, combining traditional blocks with the freedom of string piecing in the alternate blocks. Students will do SOME precutting, and the use of the Easy Angle Ruler will be demonstrated in class as well as basics of string piecing! Adorable scrappy baskets are framed by a colorful riotous frame of string piecing, turning each block on point! 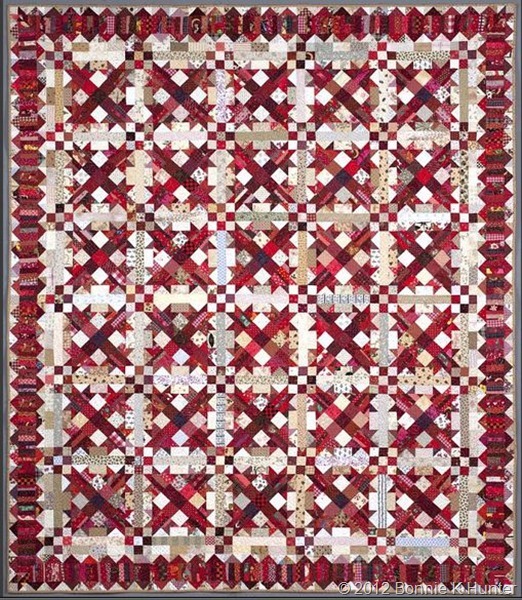 Update a traditional block with the freedom of string piecing. Instruction includes the ins and outs of the Easy Angle ruler for easy half square triangles from matched pairs of strips, and foundation string piecing. Variety is the spice of the quilt! 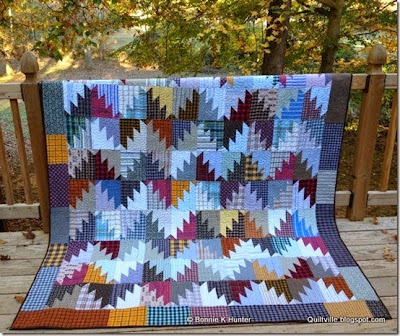 If you’ve been saving left-over Half-Square Triangles from various Quilting projects, This quilt is the perfect project for them. Square them down to 2” and piece away! 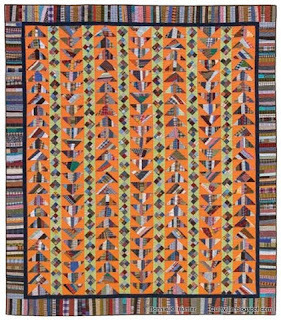 Hawk's Nest is a vibrantly scrappy quilt with multiudes of half-square triangles, perfect for using Easy Angle ruler and 2" strips. We will be focusing on use of the Easy Angle for 1/2 square triangle units, piecing the blocks with the half square triangles and squares. A fun day for all! 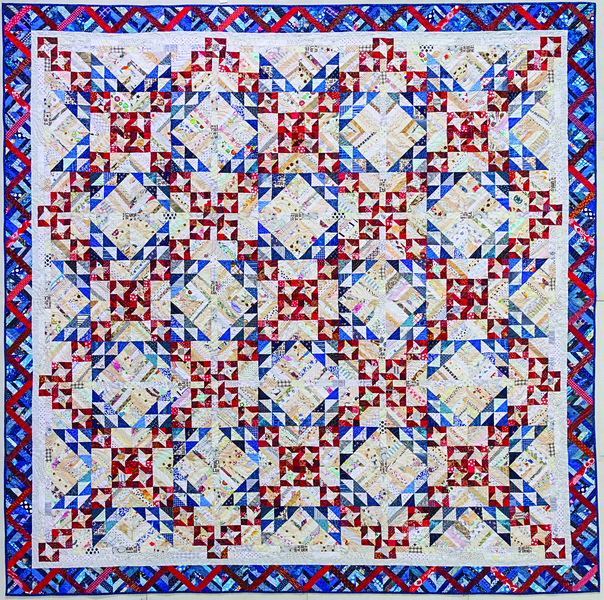 Smith Mountain Morning is a two-block quilt, with the star block, a 54-40 or Fight variation, in two colorways, and a Chimney and Cornerstones log cabin variation which is rotated to complete the design between the stars. This pattern is found in my book Scraps & Shirttails II which may be purchased from my website at Quiltville.com. Students will learn the use of specialty rulers for half square triangles using the Easy Angle Ruler, Quarter Square Triangles using the Companion Angle Ruler, and the Tri Recs rulers for the tall star points! Based on a split 9 patch design, these blocks can be placed in numerous designs as with any log cabin block! The ideas are endless! We will be focusing on use of the Easy Angle for 1/2 square triangle units, piecing the blocks with rectangles, squares, and 1/2 square triangles, and learning how to do the cornerstone braid borders! From my book Scraps & Shirttails II. Easy Angle Ruler also required. Fun with 9 patches and half square triangles! Based on a traditional Jacob's Ladder design, these blocks sparkle with the placement of the little 9 patch units within each block. This is a great class for swapping 1.5" strips for more variety! A great class for the confident beginner as well as more advanced piecers, we will be focusing on the use of the Easy Angle Ruler for the 1/2 square triangle units. Great class for clearing out the scraps and making something absolutely stunning! 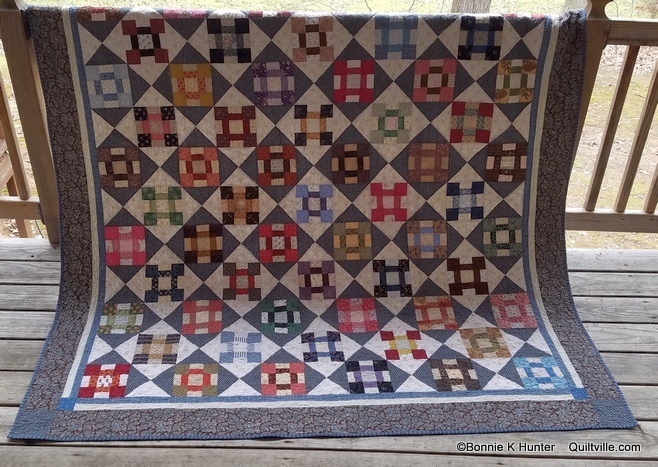 Students will come with pre-cut rectangles and squares, and may bring extra for trading with others in the class, to create a larger variety in their quilts. A great class for getting in the habit of using units as "Leaders & Enders" to keep piecing continuous! 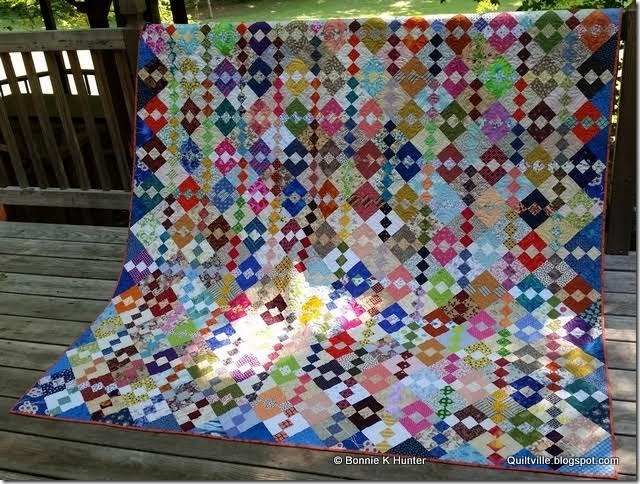 Have you always wanted to make a scrappy two color quilt? Now is the time! 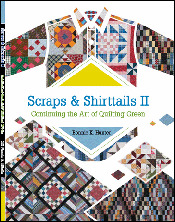 This is a great class for pulling scraps and fabrics in 2 specific complimentary colors. Red/White, Black/White, Blue/Cream, Pink/Brown, Blue/Yellow....any two colors that contrast with each other! This is also a great class for learning to use the Easy Angle Ruler if so desired. I love this ruler, and use it for all my 1/2 square triangle needs. This quilt has 1/2 square triangles that finish at 3", and if you have a method/ruler that you love, be it thangles, triangles on a roll, rulers, or the old fashioned way of "adding 7/8" to the finished measurement"....we will go through all different ways to find the perfect triangle method that works for the way YOU sew! 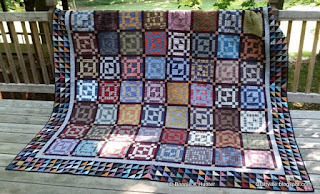 Extra Bonus Fun....this block can be laid out in ANY log-cabin-style layout...come up with a layout that is uniquely YOU for a quilt that looks different than anyone elses! Create a grove of Crab Apple Trees from 1.5" strips in light and dark! This class involves strip piecing for the tree tops and the checkerboard border, and beginning paper piecing for the tree bases. GREAT way to use up scraps, and swap scrap strips with each other for more variety! Virginia Bound is the flagship quilt from my book "Scraps & Shirttails". 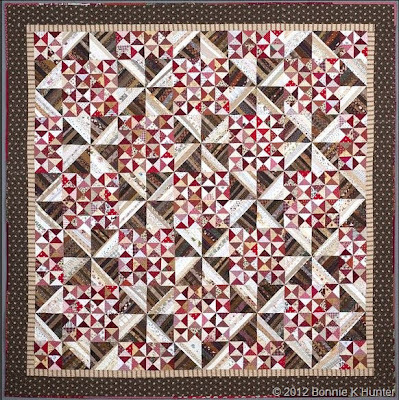 Based on the traditional Rocky Road to Kansas block, I have revamped it for foundation piecing! Even the setting diamonds are string pieced. :c) A wonderful border surrounds the quilt. I made this quilt using all the 'strings' and small parts left from cutting up recycled shirts to use in quilt making. It's a FUN class, no matter what fabrics the students choose. 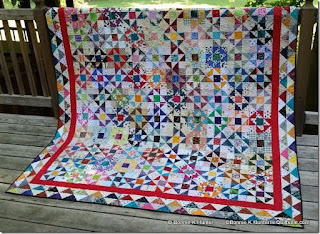 Simply go all scrappy, by separating lights from darks, or choose a two color scheme such as blues/yellows, or reds/greens for a gorgeous christmas quilt. These workshops are perfect for a 3 or 4 hour half day session. Can be extended to full day if desired. The perfect HANDS ON class for English Paper Piecing with no machine required! 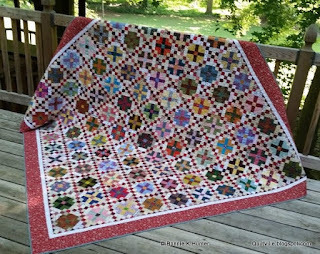 Learn the basics of relaxing hexagon patchwork using the English Paper Piecing method. Students only need to bring themselves, their favorite thimble (if they use one) and a sewing needle (I recommend a size 10 sharp) and a medium neutral thread such as light grey! Kits will be provided for each student at $8.00 each. Kit includes background fabric, border fabric, and rosette fabrics and paper foundation pieces. Please let me know how many kits your group needs in advance so I can have them on hand for you. Perfect for beginners and experienced quilters alike, this class is all about color, contrast, value and variety as we stitch up little blocks from 1-1/2'' strips and 2-1/2'' squares. While the Chunky Churn Dash blocks are easy, Sewing and pressing hints will ensure correct unit size every time. The Essential Triangle Tool will be demonstrated for easily constructing the alternate hourglass units from easy to cut strips instead of traditional rotary cutting methods from squares. Let's sew up the scraps! 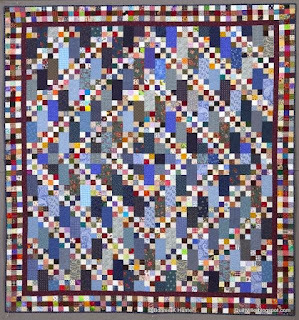 When Made using planned chains of color that form radiating diamonds around each center square, this pattern is called "Many Trips Around The World". But let's take the organized rounds of colors away, and free ourselves while letting "Anything Go!" We are just Scrappy Tripping! A Cousin to the Scrappy Bargello above, this workshop has us piecing panels which are sliced and rearranged into 12" blocks of chained squares, which are then rotated and turned to create the "Many Trips Around The World" layout! A great scrap user, Students will bring pre-cut 2.5" X 18" strips ready swap, share, and stitch! Also works with Jelly Rolls. The objective in this workshop is for students to learn the basics, and the fun and freedom of strip piecing while using up a variety of scrap fabrics! The more fun the fabrics, the better this quilt looks! Variety is the spice of the quilt. Students will bring 2" strips for swapping. Companion Angle ruler required. Students will bring scraps and strips to share with others in the class so that everyone has a variety of fabrics to play with. The objective in this workshop is for students to learn the basics, and the fun and freedom of string piecing! Quick 8 pointed stars are made from 2.5" scrap strips with no set in seams! Blocks finish at 12" for a quick lap quilt all from scraps. This class also works great with Jelly Rolls. Perfect for Jelly Rolls, Fat Quarters and/or scraps, Strip Twist has a mesmerizing design that may remind you of parquet floor tiles. Construction is easy, and you will get through that stack of scraps in no time! This class can be given as a full day or half day workshop. These classes are more intense and take a 6 hour workshop day. 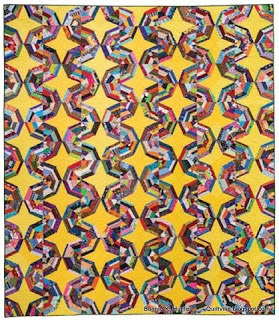 Students will bring pre-cut 2.5" strips ready to power sew into tessellating star struck blocks! This quilt goes so fast,everyone will have a pile of blocks in no time. Students can also have fun swapping strips with each other for more variety in their quilts. Focus on USING YOUR STASH encouraged! Students will bring pre-cut 2" strips ready to construct a whole neighborhood of fun houses! Students can have fun swapping strips with each other for more variety in their houses. Focus on USING YOUR STASH encouraged! 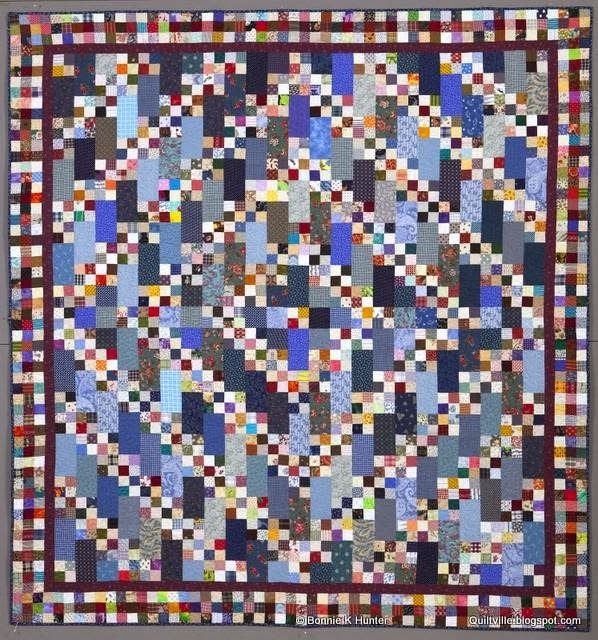 The original "Anything Goes" quilt! Students will bring pre-cut 2.5" strips ready to piece easy and scrappy bargello panels. 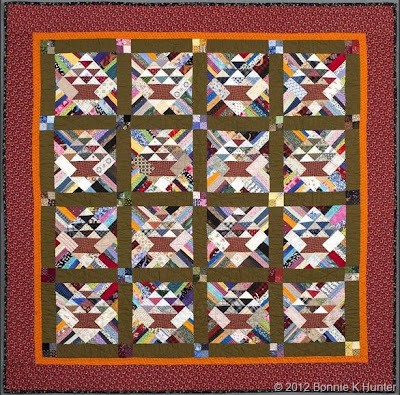 Swapping strips is also a fun way to incorporate more variety in this quilt. Focus on USING YOUR STASH encouraged! 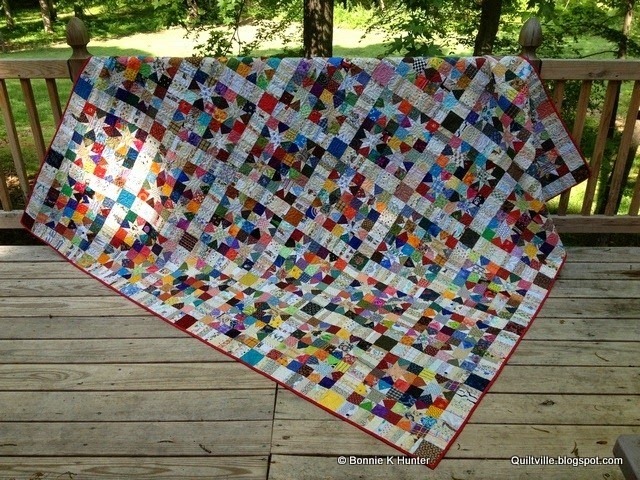 A great quilt for using larger pieces of leftover fabrics! Students will bring pre-cut 8.5" squares in pairs of light/dark. 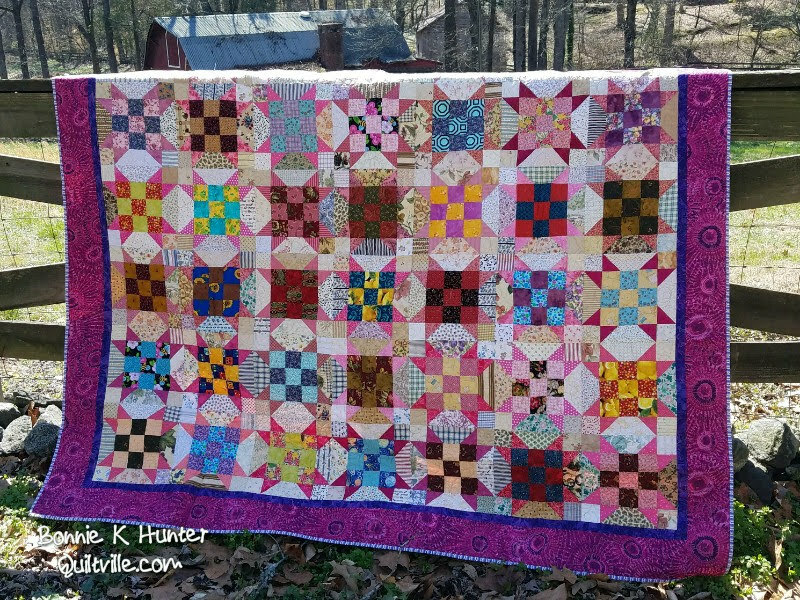 Many layouts provide lots of options for this fun quilt! This quilt is perfect to learn how to use the specialty rulers I love and use so much in my scrap quilting! 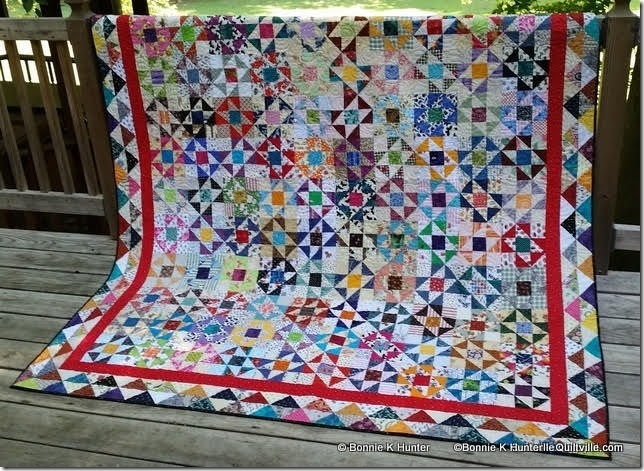 This is an exceptionally good class for beginning quilters, as we cover basic units like half square triangles, flying geese and hour-glass. What a scrappy web we'll weave as we spend a day of string piecing on old-timey spider web blocks! 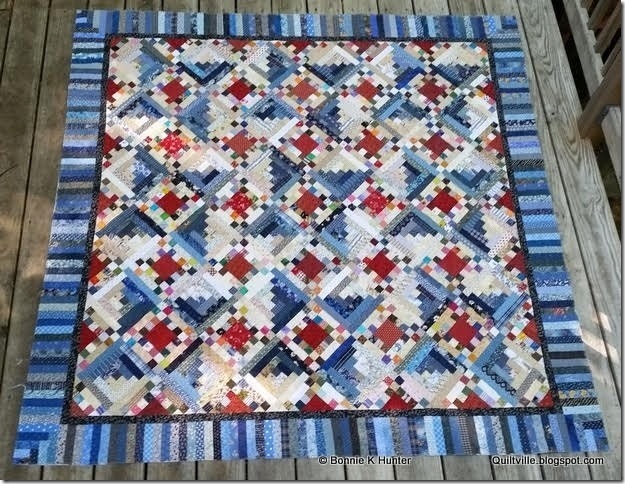 String piecing is fun and economical and a great way to make a dent in the scrap stash. Everyone loves star blocks! And this one is a favorite with it's 9 patch center and easy star points. 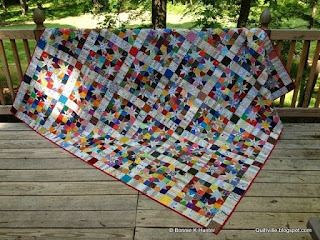 This is also a great scrap buster as the whole quilt center is made from 2.5" strips! Great for Jelly Rolls too. Block size: 10". A great beginners class and fun for advanced piecers too! This entire top with the exception of borders is made from 2" strips and squares. Students will come to class with pre-cut units ready to power sew into beautiful double-star blocks that require no inset y seams. Great stash buster! Another great beginners class, and also fun for advanced quilters who want instruction on using the EZ angle Ruler and the Tri Recs Rulers and a way to dig into the scrap stash. 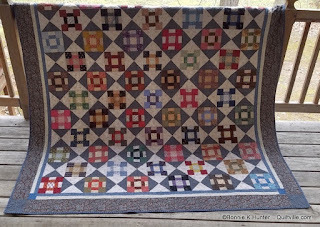 Quilt is made from 2" and 3.5" strips, and is easier than it looks! Do you have lots of SMALL scraps around? This quilt is completely made with 2.5" squares and 2.5" X 4.5" bricks! You can choose a color scheme, or play completely scrappy. In this class you can even TRADE lights and darks with other class mates for more variety. 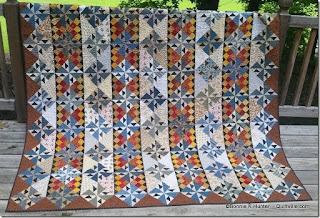 Oklahoma Backroads is a VERY fun quilt that also provides "bonus" 1/2 square triangles that can be used in future projects, or as an additional border. Quiltville's Calendar! Where I'll Be! Click HERE for my Contract. Booking and pricing info and other important details are found there. Please contact me at quiltville@gmail.com to set preliminary dates and to reserve your spot in my schedule. Please do not send me a contract without pre-approval of your requested dates! Also note that schedules may change without notice until a contract is received. A signed contract locks in your workshop/lecture fee in the event of a price change.